Welcome to the #1 spot for Destin Parasailing on Florida's Emerald Coast! Destin Parasailing uses the latest in Parasailing Technology and our CWS boats exceed Coast Guard safety regulations. Our boats are a 12 passenger inspected vessels. Our equipment is always new and checked daily by our USCG Certified Captains to help ensure that you have a safe, fun and easy parasailing adventure! Book your Destin Parasailing adventure online today! 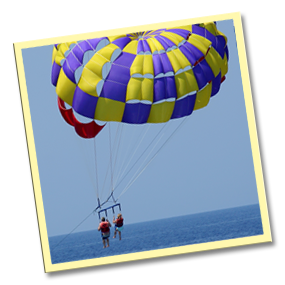 We offer single, double & triple parasailing rides. We also have available photo packages, video packages & "X" t-shirts. • All fliers must be over 6 years old.